Image: First, remove the metal flame holder. 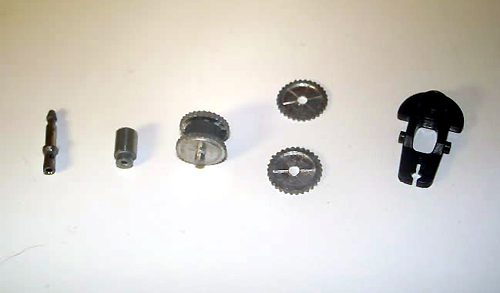 Image: The igniter wheel, washers, flint, and spring. ^ This is the thing we're interested in. 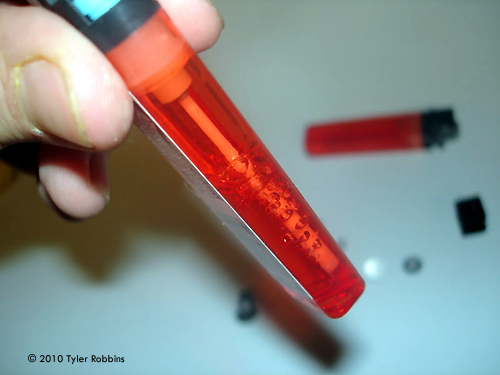 Image: Bubbles form as the Butane evaporates. 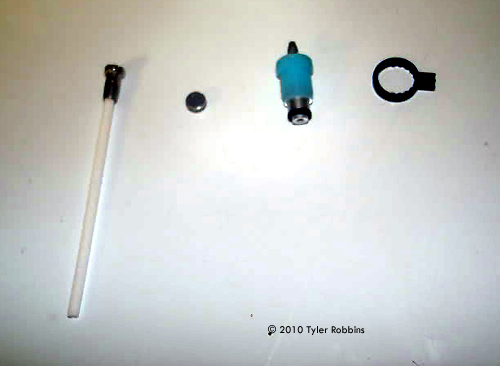 Image: These are the remaining components. ^ The metal tube slides freely. Image: Push gently against the work area. Image: The parts we need. Be sure to read the whole article before starting; there is a health warning associated with this article. Let's get something out of the way right now: I'm a greeble junkie. Now, I assume that you are familiar with the word greeble, but in case you're not, here is the definition: a greeble (otherwise known as a greeblie, nurnie, widget, or any of about 1,000 different names) is a small part or assembly that is meant to spruce up the surface of an otherwise barren model. 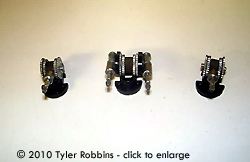 Most people assume that greebles are obtained from model kits, or else are custom made from styrene sheet, rod, tube, etc. and they would be correct. What most don't realize is that there are any number of good greeble sources out there, which can inspire one to come up with an unusual design, which would look awesome on a Star Destroyer, Enterprise, or Battlestar. I'm not going to get into all the various gadgets and gizmos that would make fine sources of greebles, myriad as they are. Instead, I'm writing a simple how-to article that might inspire you, the intrepid builder, to start searching through all the junk that we throw away on a regular basis (ain't it lovely being a consumer nation?) in hopes of finding an interesting nurnie that can be turned into a shield generator, scanning telescope, or laser turret. Yeah . . . a laser turret. Now, what would make a good turret? Well a turret needs a gun or other weapon, an elevating mechanism, and a base, which may or may not rotate. 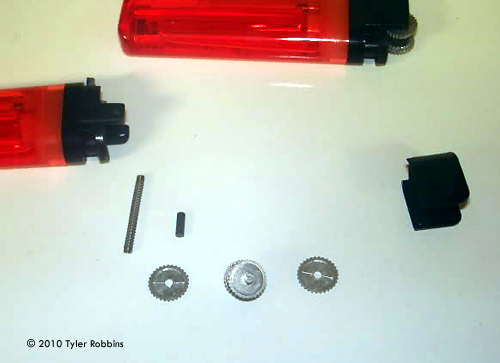 Believe it or not, a simple disposable lighter has all the parts necessary to create a simple laser turret with a single barrel, and it requires no tools apart from a tube of superglue (or epoxy if you want it to be more permanent) and your fingers. I got two of packs of disposable lighters for $5 on sale at Walgreens. You could probably get a million for a penny. 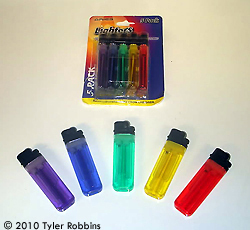 If you don't want to spend money on something you'll be tearing apart anyway, find a smoker relative or friend and have him/her give you their spent lighters. Or else if you are one of the lucky (?) people who smoke, you might happen to have these lying around anyway. Hopefully your wife/girlfriend/mother isn't trying to make you quit, and if they are, say you need to continue your awful habit for the sake of your hobby. Yeah. She'll go for that one. Anyway, your first task is to pry off the metal flame holder on top of the lighter body. It's not glued in place (usually) so if you lift up on one side and pull gently, it should pop straight off. 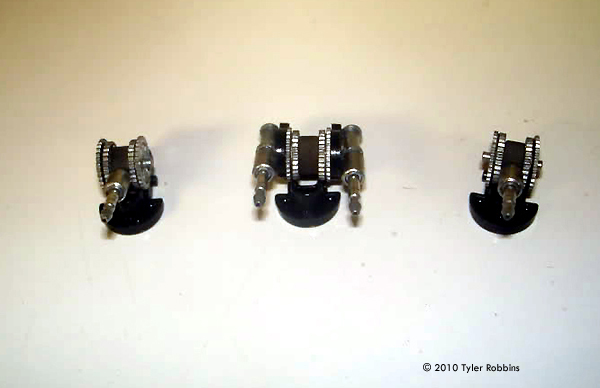 After you have removed the flame holder, gently pull back on the bar with the hole in it that is holding the igniter wheel in place and carefully lift out the wheel and the two groovy washers on either side. A small black piece of flint will fall out, and after it does you need to extract the spring. Don't want that thing bouncing around on you. Next pull out the thumb lever by lifting up and forward until it pops loose from the butane nozzle. Once that is done we can begin the tricky process of removing the nozzle itself. Now, at this point I should warn you: butane is NASTY, NASTY stuff!! Be very careful to point the nozzle away from your face to avoid inhaling too much of the stuff, as it has a laundry list of diseases it causes and is the most common cause of solvent-related death. 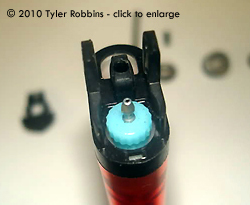 What you need to do is start unscrewing the little plastic holder that the nozzle is stuck in. To do that, lift up on the little Q-shaped thingy until it's free of the plastic holder, and use that just like a wrench to unscrew the nozzle until it becomes loose enough to unscrew with your fingernail. Once you hear a hissing sound, STOP, point the nozzle away from your face and hold it away from your body, then continue the process of unscrewing the nozzle. Eventually it'll get to the point where you can just let the liquid butane drip out. As long as you don't let it drip onto your skin (frostbite is one of the side-effects of butane exposure), you can just let it fall where it may. It evaporates so quickly that it doesn't soak into anything, and it will dissipate harmlessly into the atmosphere (though if you plan on emptying more than one or two, I'd suggest a ventilated location to do this). EDITOR'S NOTE: The author is a little too flippant here, perhaps, but the warning is necessary. 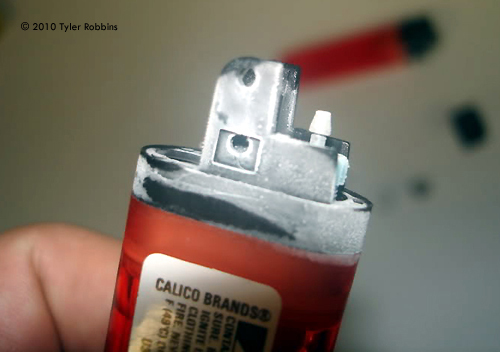 Don't inhale butane, don't let it get on your skin, and if you are going to disassemble a full lighter do it outside. You can find empty ligters on just about any gas station parking lot (!) and that may be a better way to go about this. 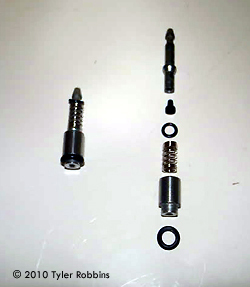 Once that nasty process is complete, you get a nice little package of nozzle parts, as well as a couple of odd metal pieces. 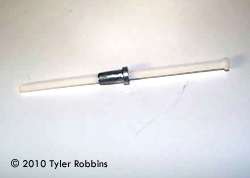 The large one on the white rod will just slide off, and the other part has a piece of cloth which can be removed with your fingernail. The part we're interested in is the nozzle. To separate it, simply push it against the work surface. If you did it right, it'll pop free. If not, then flip it over and try again. You'll see a piece of interesting tube, a spring, another tube, and several rubber gaskets. The gaskets can be thrown away (or not). 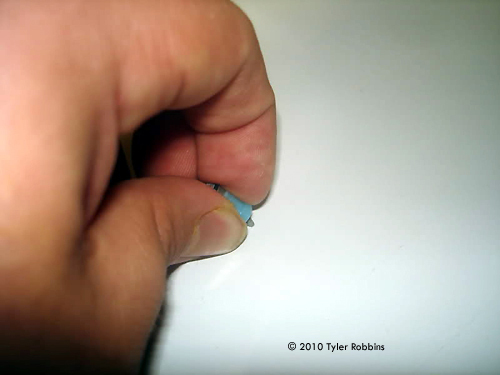 Once you get the parts separated, simply superglue the narrower of the tubes into the larger one, then superglue that to the igniter wheel, and finally glue the igniter wheel to the underside of the thumb lever. Viola'! One single-barreled laser turret. You can get more creative if you have more parts, obviously. 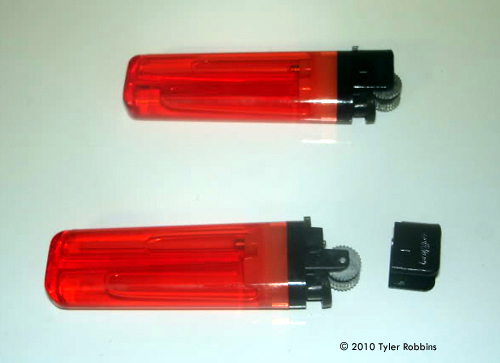 In the last picture, you can see I made a larger double-laser turret from two lighters. You can also mix and match the various tubes and stuff to create even more combinations! The possibilities are endless. This page copyright © 2010 Starship Modeler. First posted on 11 October 2010.